Stir-fries are the ultimate quick, easy and healthy meals. They are a simple way to prepare a delicious homemade meal on even the busiest of nights. All it takes is a little prep work and a good wok. In addition, they are also quite versatile.  You can literally take whatever meat and/or vegetables you have on hand, mix up a sauce (or use a store-bought sauce), and in minutes you have a wonderful stir-fry meal on the table. Few recipes are faster and easier to make than stir-fries. But keep in mind that quick cooking time means that things are going to move fast. Therefore, I always find it much easier to have everything ready to go. The meat and vegetables are chopped ahead of time (those pre-cut bags of veggies at the grocery store can save you even more time), and even the sauce ingredients are already whisked together in a small bowl and placed within easy reach. 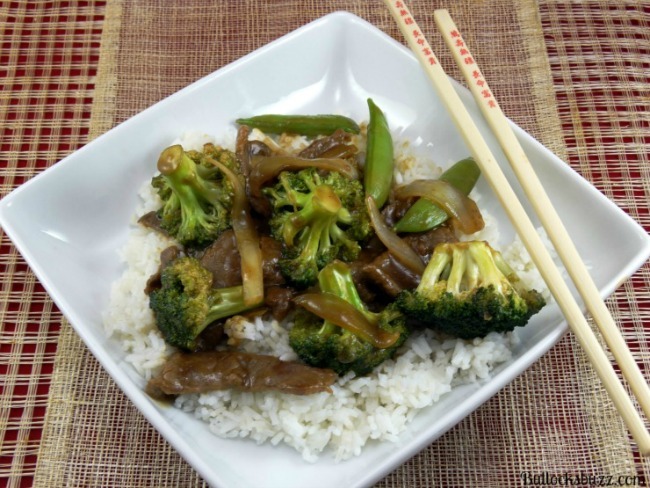 One of my family’s favorite stir-fry recipes is a delicious blend of beef and vegetables served over white rice. It literally just takes minutes to toss this tempting stir-fry together for the perfect weeknight meal! Begin by cutting the beef into strips, slicing against the grain (across the striated fibers). 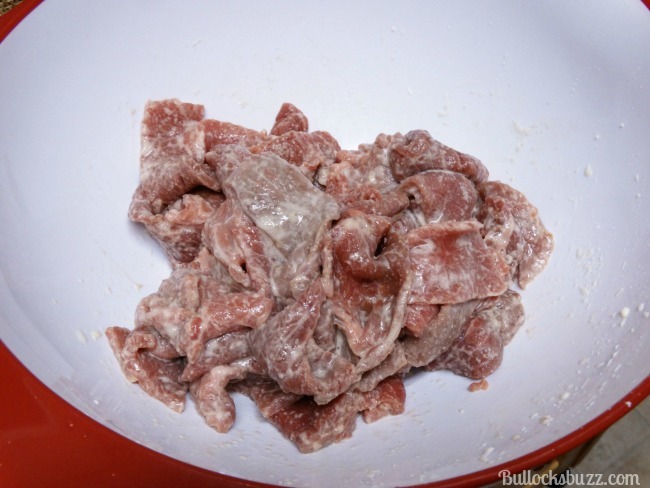 This makes the meat more tender. Next, combine 2 tablespoons cornstarch, 2 tablespoons water and garlic powder in a bowl, whisking until completely smooth. Add in the beef and toss. 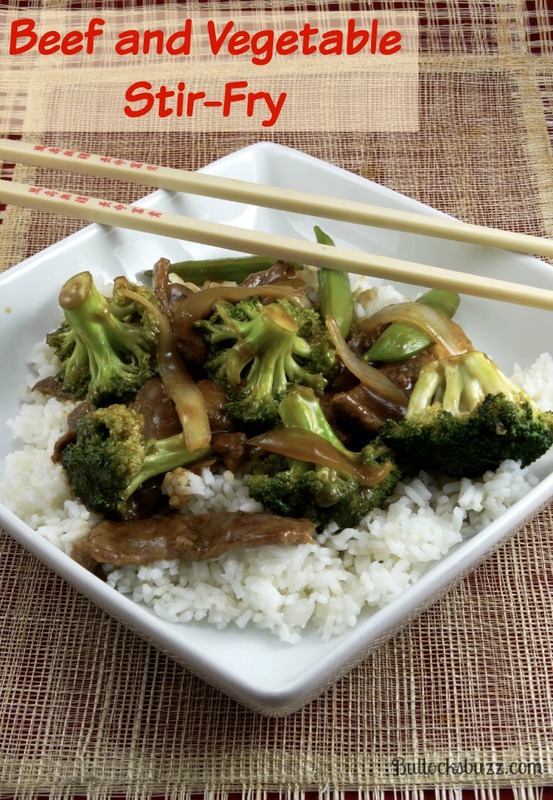 In a large skillet or wok over medium high heat, stir-fry the beef in 1 tablespoon oil until beef reaches desired doneness; remove and keep warm. Stir-fry the broccoli, snap peas, mushroom and onion in the remaining oil for 4-5 minutes. Then return beef to pan. Cook and stir for 2 more minutes. Then serve over steamed or cooked rice. 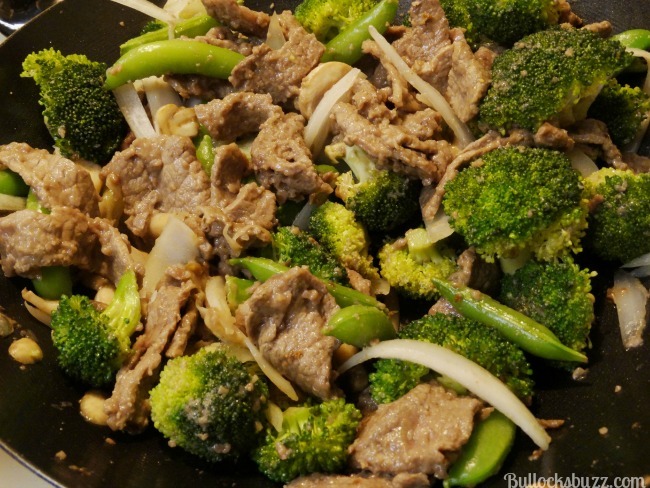 Do you have a favorite stir-fry recipe? Share it with us in the comments below! 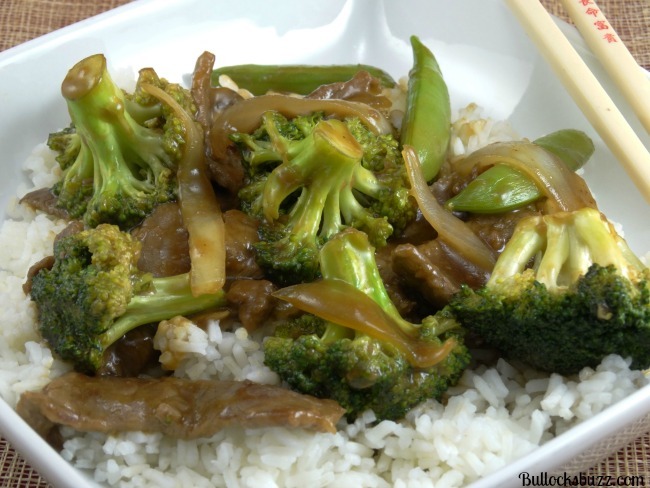 A delicious blend of beef, broccoli, snap peas and mushrooms, covered in a soy and ginger based sauce, then served over a plate of steamed rice. Quick and easy! Stir-fry the broccoli, snap peas, mushroom and onion in the remaining oil for 4-5 minutes. Then return beef to pan. Serve over steamed or cooked rice. If you prefer a lot of sauce, you may want to consider doubling that part of the recipe. I agree that stir fry is one of the best, easiest, healthiest meals. We recently bought a larger wok, so this just gave me inspiration to test it out.